I created this guide to inform you about research materials that I think will be helpful for your paper topics. My intention was to focus on the topic ideas that have been presented to me by the group thus far. As the librarian liaison for your group, you are welcome to contact me directly for help with your research. My contact information is at the top of this screen. I have attempted to include in this guide only information that is not duplicated in our other guides. Therefore, you may find the guides listed below useful as you work with the library's resources to research your papers. Topics covered: overview to citation software, Zotero, EndNote, Perma.cc, citation style guidelines. Topics covered: blogs, feed readers, academic journals, HLS student papers, finding a faculty supervisor. Topics covered: In-depth instructions for searching the HOLLIS library catalog, including basic search, advanced search, and FAQ. Topics covered: How to use HOLLIS, specifically for LLMs, including links to training videos and how to request LLM papers that have "technical" status in HOLLIS. The law library's research guide for international arbitration was updated very recently and it is available at https://guides.library.harvard.edu/international-arbitration. The international arbitration research guide covers how to use the library's print materials and subscription databases to find arbitration treaties, rules, awards, and commentary. Both commercial and trade arbitration are considered. To avoid duplication, this guide for your LLM writing group will not feature information about arbitration research. The library uses the Library of Congress Call Number System (https://www.loc.gov/catdir/cpso/lcco/), which is organized by subject, to assign call numbers to its materials. A call number that starts with "K" alone means that the book is about law in general. There are jurisdictional "subclasses" within K; for example, books with call numbers that start with "KF" are about United States law. Another important subclass is "KZ" which designates materials about international law. Following the class/sub-class indicator in the call number is a number that indicates the subject of the book. The Library of Congress Classification Outline for Class K materials is at https://www.loc.gov/aba/cataloging/classification/lcco/lcco_k.pdf. Why are call numbers important for research? Only a percentage of the law library's materials are physically here in the law library building. Most of them are in an offsite storage location. In addition, several other Harvard libraries have materials related to law. If you go to the law library's main reading room and look at the shelves with books whose call numbers start with K3840, you will only see a portion of Harvard's books on the international trade law and regulation. You can browse by call number across the entire Harvard Library collection, including HD, electronically through Hollis. On the HOLLIS homepage, click Starts With / Browse at the top of the screen. Select the option to Browse by Call Number - Library of Congress, enter K3840 in the search box, and press Return. In addition to its call number system, the Library of Congress has created a controlled vocabulary to describe subjects in catalog records for library materials. Many catalog records in HOLLIS include these controlled, predefined vocabulary terms, which are called Library of Congress Subject Headings (LCSH) (http://id.loc.gov/authorities/subjects.html), in the Subject field. Although there are also other lists of subject terms that catalogers also use, the LCSH list predominates in the HOLLIS catalog, especially in records for newer materials. Using subject terms from a controlled vocabulary like LCSH to search for materials in HOLLIS can be especially helpful to comparative law researchers who want, in a single search, to find materials in several different languages that all discuss the same subject. Researchers may also find that subject searches return more accurate results than general keyword searches. Below are links to some sample HOLLIS searches by subject, using LCSH and other predefined subject terms. The searches are meant to be quite broad. To limit the displayed search results, you can edit the search to add additional keywords, and/or you can use the limiting options on the right side of the HOLLIS search results screen. HOLLIS Search: Subject = "Commercial Policy"
HOLLIS Search: Subject = "Customs Unions"
HOLLIS Search: Subject = "Developing Countries -- Commercial Policy"
HOLLIS Search: Subject = "Economic Sanctions"
HOLLIS Search: Subject = "Favored Nation Clause"
HOLLIS Search: Subject = "Foreign Trade Regulation"
HOLLIS Search: Subject = "Free Enterprise"
HOLLIS Search: Subject = "Free Trade"
HOLLIS Search: Subject = "General Agreement on Tariffs and Trade"
HOLLIS Search: Subject = "International Economic Relations"
HOLLIS Search: Subject = "International Trade"
HOLLIS Search: Subject = "Sanctions (Law)"
HOLLIS Search: Subject = "Tariff -- Law and Legislation"
HOLLIS Search: Subject = "Trade Regulation"
HOLLIS Search: Subject = "World Trade Organization"
HOLLIS Search: Subject = "Bilateral Investment Treaties"
HOLLIS Search: Subject = "Foreign Direct Investment"
HOLLIS Search: Subject = "International Finance -- Law and Legislation"
HOLLIS Search: Subject = "International Investment Agreements"
HOLLIS Search: Subject = "Investment Contracts"
HOLLIS Search: Subject = "Investments, Foreign"
HOLLIS Search: Subject = "Investments, Foreign -- Law and Legislation"
HOLLIS Search: Subject = "Sovereign Wealth Funds"
HOLLIS Search: Subject = "Antitrust Law"
HOLLIS Search: Subject = "Competition Law"
HOLLIS Search: Subject = "Predatory Pricing"
HOLLIS Search: Subject = "Economic Development"
HOLLIS Search: Subject = "Electric Utilities"
HOLLIS Search: Subject = "Energy Policy"
HOLLIS Search: Subject = "Finance, Public"
HOLLIS Search: Subject = "Infrastructure (Economics)"
HOLLIS Search: Subject = "Municipal Services"
HOLLIS Search: Subject = "Political Corruption"
HOLLIS Search: Subject = "Public Contracts"
HOLLIS Search: Subject = "Public Works"
HOLLIS Search: Subject = "Artificial Intelligence -- Law and Legislation"
HOLLIS Search: Subject = "Big Data -- Political Aspects"
HOLLIS Search: Subject = "Computer Networks -- Law and Legislation"
HOLLIS Search: Subject = "Data Protection -- Law and Legislation"
HOLLIS Search: Subject = "Data Transmission Systems -- Law and Legislation"
HOLLIS Search: Subject = "Digital Media -- Law and Legislation"
HOLLIS Search: Subject = "Electronic Commerce -- Law and Legislation"
HOLLIS Search: Subject = "Electronic Surveillance -- Law and Legislation"
HOLLIS Search: Subject = "Information Storage and Retrieval Systems -- Law"
HOLLIS Search: Subject = "Intellectual Property -- Law and Legislation"
HOLLIS Search: Subject = "Internet -- Government Policy"
HOLLIS Search: Subject = "Internet -- Law and Legislation"
HOLLIS Search: Subject = "Law -- Computer Network Resources"
HOLLIS Search: Subject = "Law -- Data Processing"
HOLLIS Search: Subject = "Mobile Communication Systems: Law and Legislation"
HOLLIS Search: Subject = "Online Social Networks -- Law and Legislation"
HOLLIS Search: Subject = "Personality (Law)"
HOLLIS Search: Subject = "Science and Law"
HOLLIS Search: Subject = "Social Media -- Law and Legislation"
HOLLIS Search: Subject = "Technological Innovations -- Law and Legislation"
HOLLIS Search: Subject = "Technology and Law"
HOLLIS Search: Subject = "Telecommunication Policy"
HOLLIS Search: Subject = "Conflict of Laws"
HOLLIS Search: Subject = "Customary Law, International"
Use periodical indexes and databases to find relevant scholarly articles for your topic. Those listed below focus on the social sciences, including law, political science, economics, and other areas that will be of interest to people in this group. Note that some indexes only provide citations to articles. For those, you will need to search for the journal title in HOLLIS to learn which database(s) we subscribe to that provide access to the journal. To search for a subscription database that is not listed below, visit https://databases.hollis.harvard.edu/. Indexes social sciences articles, covering topics including health, social services, psychology, sociology, economics, politics, race relations and education. Scholarly index operated by Germany's Bielefeld University Library; indexes more than 90 million documents, many of them open access. Interface available in English, German, Polish, French, and Chinese. Full text of near 300,000 book chapters and journal articles, covering the Humanities, International Law and Biology. Index of legal journal articles compiled by the Gallagher Law Library at the University of Washington. For more information, visit https://lib.law.washington.edu/cilp/cilp.html. French-language index of legal scholarship. Use this interface to search Google Scholar by keyword, author, journal of publication, and publication date range. Provides indexing and links to full text articles from over 300 of the most important periodicals published by agencies and departments of the United States Federal government. Provides comprehensive coverage from inception of more than 2,600 law-related periodicals. A leading international and interdisciplinary reference work documenting academic periodical literature in the humanities, social sciences and related fields. Index of texts published in honor of common law legal scholars or events; operated by the University of Auckland (New Zealand) Library. Note: if Harvard does not own a Festschrift that you find in this index that you need for your research, please let Jennifer know. 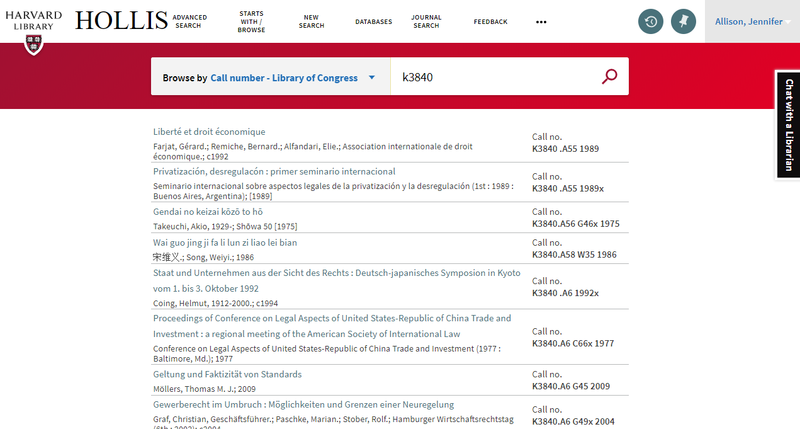 A subject index to selected international and comparative law periodicals and collections of essays, maintained by the Berkeley Law Library and the American Association of Law Libraries. Index to legal scholarship materials, including articles, symposia, jurisdictional surveys, court decisions, books, book reviews. Index with over 3 million bibliographic references to journal articles and to books, reviews and selected chapters dating back to 1951. Provides page images of back issues of the core scholarly journals in the humanities, social sciences, and basic sciences from the earliest issues to within a few years of current publication. Users may browse by journal title or discipline, or may search the full-text or citations/abstracts. New issues of existing titles and new titles are added approximately on a weekly basis. Indexes articles from legal journals published in the United Kingdom and Europe as well as journals covering topics pertaining to the laws of the European Community and its Member States. Lexis Advance includes access to US and foreign law journal articles, as well as many other legal research resources. Oxford University Press (OUP) publishes the highest quality journals and delivers this research to the widest possible audience. Oxford Bibliographies offers exclusive, authoritative research guides. Combining the best features of an annotated bibliography and a high-level encyclopedia, this cutting-edge resource guides researchers to the best available scholarship across a wide variety of subjects. PAIS International is an index for scholarly materials related to public affairs, public and social policy, international relations, and world politics. Database of millions of citations for articles published in the arts, humanities and social sciences, across more than 300 years. Provides access to highest quality books and journals in the humanities and social sciences from over 200 of the world’s most distinguished university presses and scholarly societies. Provides full-text access and indexed searching for journals in sociology, political science, criminal justice, education, linguistics, and more. Social sciences database with more than one billion citations referring to more than 200 million different source terms. SSRN´s eLibrary provides 820,635 research papers from 394,428 researchers across 30 disciplines. Westlaw includes access to US and foreign law journal articles, as well as many other legal research resources. The Encyclopedia provides balanced and comprehensive coverage of the major domain in law and economics, including: criminal law, regulation, property law, contract law, tort law, labor and employment law, antitrust law, procedural law, and the production of legal rules. Provides descriptions of the statutory and regulatory landscape in multiple jurisdictions, written by practitioners. Areas covered: Air Transport - Anti-Corruption Regulation - Arbitration - Banking Regulation - Cartel Regulation - Construction - Copyright - Corporate Governance - Dispute Resolution - Dominance - e-Commerce - Electricity Regulation - Environment - Franchise - Gas Regulation - Insurance & Reinsurance - Intellectual Property and Antitrust - Labour & Employment - Licensing - Life Sciences - Merger Control - Mergers & Acquisitions - Mining - Modernisation in Europe - Oil Regulation - Patents - Pharmaceutical Antitrust - Private Antitrust Litigation - Private Equity (Fund Formation) - Private Equity (Transactions) - Product Liability - Product Recall - Project Finance - Public Procurement - Real Estate - Restructuring & Insolvency - Securities Finance - Shipping - Tax on Inbound Investment - Telecoms and Media - Trademarks - Vertical Agreements. Published by Wolters Kluwer; includes national monographs covering relevant areas of law, including commercial/economic law, competition law, private international law, and others. Increasing trade is key to ending extreme poverty and boosting shared prosperity. The World Bank Group helps its client countries improve their access to developed country markets and enhance their participation in the world economy.